i am eating tacos, i like tacos, yes almost all kind of tacos, Green salsa tacos, yes i like beans tacos, do you know how many combinations of salsas you can add, do you know how many combination of vegetables you can add, yes you can have them regular and fried, prefer fried mmmm, i love tacos. Stayed at my sisters in a far away touro town , Mexican around the corner ... tacos galore, all types ! Is there an 'international taco day ' ? This is very popular in Oaxaca I think, personally I do not know much about Oaxaca I am from central Mexico. 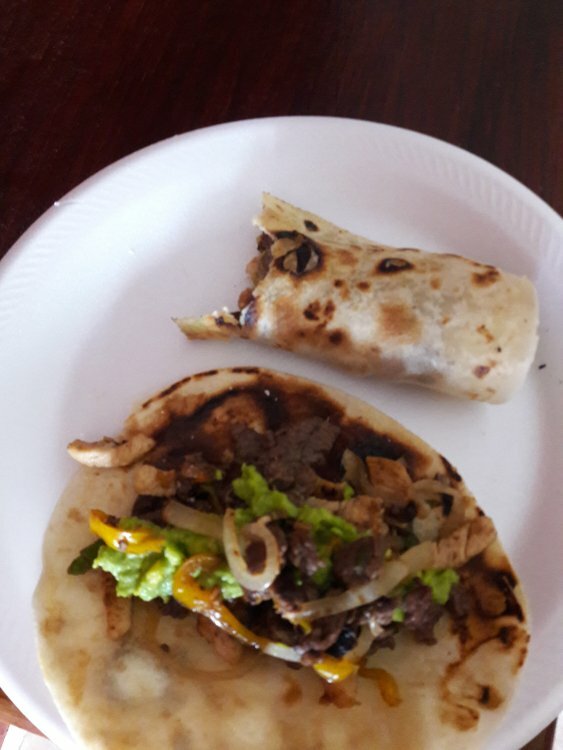 I dont know if there is a internation taco day, but sometimes they make taco fest and they sell of kind of tacos in my town. ..... and some tacos . cant say I was impressed ..... pretty crappy actually . What sort of place has a bar in a drive through restaurant ? There was an international taco day but they had to make a national taco day and change the date . No wonder the country is going down the drain ! .... I mean , the flush toilet ! 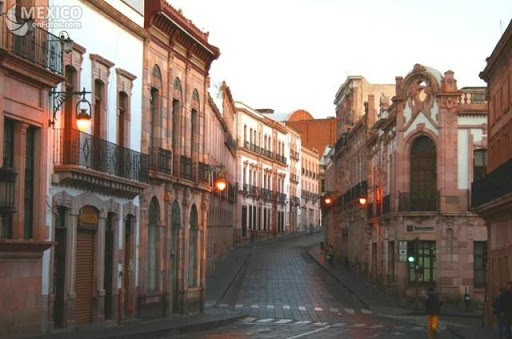 Here`s a pic of the main drag in Zacatecas. It`s beautifully colonial in the center, not quite so beautiful outside the center. Ten minutes up the street from where this picture was taken (not by me, I just get it off the internet) there`s a hole-in-the-wall place, only open at night, with the best tripe tacos. The tripe is cooked in a big vat of oil, not for the fat phobic. We usually got ours to go, but you can also eat there on little communal benches. Hole in the walls, can be great finds. I find the best are near pawn shops for some reason. Also if there's a cop car infront it's usually a plus, in that cops know good cheap eats. Lately my favorites are those that keep it simple, where the meat shines, the shell is glistening with oil and the addons, cilantro.. onions, pickled stuff are sparse. Don't know if its authentic, I'm seeing some good hole in the walls that are doing there meat on a gyros style spit. That can be awfully good. Tacos al pastor are done on a gyro style spit all over Mexico (pictured below). 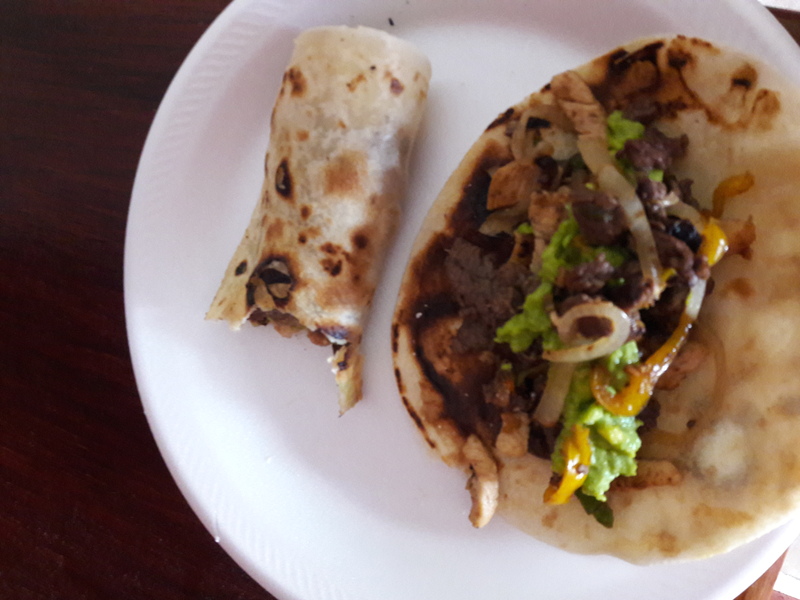 There`s also something called "tacos arabes" -- arabic tacos -- a specialty of Puebla. The meat for tacos arabes is also cooked on a spit like shawarma and piled into a thick pita-esque bread. I don`t care a whole lot about authenticity myself as long as something tastes good. My mom used to make the best tacos that we`d top with jack cheese and American style sour cream. Not very authentic but boy were they yummy. This toilet I think it is a good idea to save wáter. I am sorry, I have to say that not all the mexican food is good in mexico ither. i think it is more about how much time and effort you put into making it. These tacos were really good, so good I went against my no refined carbohydrate rule and ate tortillas. Well, just to get even with all you taco lovers, I'm having pizza tonight, with jalapenos and anchovies. The anchovies are going to have way more salt than my body need and I will likely hear from it. But I don't care. Salt cooking would be good if the food is going to be sitting around for a while after cooking. The salt would prevent, to a degree, nay meat from spoiling for a while. and some impressive architecture in the city and archaeology ... love it ! and natural swimming pools ! Momax Zacatecas, Mexico acreage There are cabins in front of the property that is separated by a natural hot spring. Excellent for turisim or water business. A little under two Acreages. I made my own dry composting toilet for around $40 . And you get compost . So far I have emptied two barrels of it ( about 6 years worth ) on a little collection of rainforest trees in the garden . Certainly ! I used to work on a catering crew, one of the chefs was Mexican, from a coastal area. His recipes were simple , light, fresh a lot of seafood , but ver good ! And very different from what sells in most Mexican restaurants here .